COLUMBUS, Ga. - The Maryland Eastern Shore women and Fresno State men claimed their first United States Bowling Congress Intercollegiate Team Championships titles Sunday on ESPN2. Maryland Eastern Shore became the first team in history to win an NCAA Women's Bowling title and an Intercollegiate Team Championships title in the same season, taking down Lindenwood, 2-1. Fresno State, meanwhile, defeated the top-ranked team in the country, Webber International, 2-0, to win the men's title. 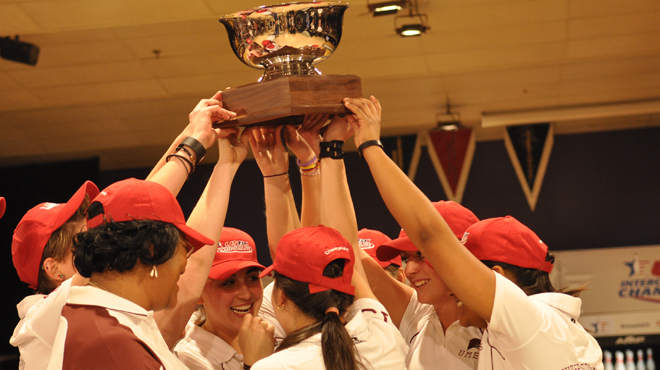 Maryland Eastern Shore knocked off Vanderbilt to claim their second NCAA Women's Bowling title last month before going on to hoist the Kerm Helmer Cup at the Intercollegiate Team Championships. "I'm still trying to feel if this is real or not," Maryland Eastern Shore coach Sharon Brummell said. "Knowing that our team is the champions in both events, there's no doubt anymore that we are the best team in the nation." Maryland Eastern Shore's Maria Jose Rodriguez barely converted the 3-6-9 spare in the final frame to beat Lindenwood, 164-158, in the deciding game. The Hawks dropped the opening game to the Lions, 182-156, before rallying back to win the second game, 189-183. "When I let the spare shot go, I thought I missed it and had cost my team the title," said Rodriguez, who narrowly made the spare by hitting the left side of the 3 pin and getting the 6 pin to fall into the 9 pin. "I was too busy thinking about all the bad shots I'd made and how hard the lanes were. I'm just glad I made it." Central Florida's Kara Bunting earned the tournament's most valuable player honors, while Lindenwood's Jenny Petzoldt was the runner-up. Danielle Merino of Adelphi, Amanda Greene of Lindenwood, Jenn Boisselle of Central Florida and Rodriguez rounded out the all-tournament team. Fresno State, which finished as the runner-up in the 2005 Intercollegiate Team Championships to Lindenwood, dedicated its victory to the memory of its long-time coach Glenn Carlson, who passed away in 2008. "This is an absolutely great feeling," Fresno State junior Greg Geering said. "This is just such a great honor for the late coach Glenn Carlson. Without all the hard work and dedication he put into our program, there is no way any of us could have made it to this point. This is for him." In the opening game, Fresno State jumped out to a 38-pin lead and stayed clean down the stretch to win 183-168. The second game was much of the same as the Bulldogs took a 36-pin lead and cruised to a 205-166 win. "We really came together as a team the last two days of match play," Geering said. "We really had a good game plan and showed a lot of resilience from start to finish." Webber International's Marcelo Suartz was named the tournament's most valuable player, while Geering was the runner-up. Joining Suartz and Geering on the all-tournament team was Jeremy Dixson of Saginaw Valley State, Geoffrey Young of Wichita State, Chris Bardol of Robert Morris-Illinois and TJ Schmidt of Purdue. For more coverage of the USBC Intercollegiate Team Championships, visit BOWL.com.